Sometimes it's necessary to adjust the waistband on a skirt or pair of pants, and you can save yourself a lot of money by doing your own clothing alterations. In many cases, waistband alteration is fairly simple for beginners or advanced seamstresses, since it does not require a great deal of sewing experience. 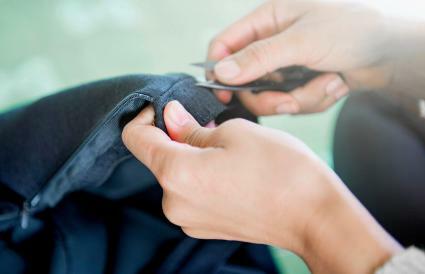 Before you head to the tailor, consider altering or repairing your own clothing. First, determine what type of alterations you need to make. Is the garment too snug in the waist? If so, you will need to let the waistband out. Is it too loose? You will need to take in the waistband. Either way, limit your adjustments to one or two inches to preserve the rest of the fit. Use the seam ripper to remove the waistband to just past the side seam on each side. Turn the garment inside out, and try it on. Pin the side seams to take up any excess fabric in the body of the garment. Use a fabric pencil to mark where you would like the waistband to end. Remove any buttons or other closures currently on the waistband. Use a seam ripper to open the ends of the waistband. Shorten the waistband to the desired length. You can do this by opening one or both ends, removing excess fabric, and then re-sewing the ends. Alternatively, you can remove the entire waistband from the garment, open it up, and create a center seam in the back of the waistband to take up any excess fabric. Machine or hand sew the side seams to bring them in to the appropriate point. Using a basting stitch, reattach the waistband. Try the garment on again. If it fits properly, finish the waistband with hand sewing stitches or by using your sewing machine on the normal setting. If it does not, adjust it and try again. Determine how much extra room you need in the waist of the garment, and then examine the garment's construction to make sure you have enough fabric. Many pieces will accommodate adjustments of one or two inches at most. Use a seam ripper to entirely remove the existing waistband. Open the side seams by a couple of inches as well. Remove any closures on the waistband, such as buttons, hooks, or snaps. Open the ends of the waistband to determine how much extra fabric it contains. If there is a seam in the back of the waistband, open this and let it out as much as possible. Try on the garment and pin the side seams to get the appropriate fit. Hand or machine sew the side seams. Measure the waistband against the new dimensions of the garment. If there is not enough fabric in the waistband, extend it with a similar fabric for the part that is hidden where the waistband overlaps to close. Baste the waistband back on the garment, and try it on again. If it fits, re-sew the waistband. If it does not, adjust it as needed. Re-attach any buttons or other closures. Sometimes, it helps to have videos to guide you through the process of taking in or letting out a waistband. The following videos can make it easy to get a proper fit. This handy tutorial from a professional tailor covers how to take in pants at the seams and waistband. It offers tips on measuring and where to take the pants in for the best fit. This helpful tutorial goes over the process of fixing a pants waistband that is too tight. Find out how to salvage as much fabric as you can from what currently exists so you can extend the waistband without adding fabric. Sometimes, you may find that there is not enough fabric to complete the adjustments, there are lots of pleats you'll need to keep even, or the cut of the garment is too complex. In these cases, it's always better to consult a professional tailor. However, in many cases, you can make your own minor waistband alterations to pants or an a-line skirt and save yourself the cost of hiring a professional.